One winter morning in 1988, I ran out the door on my way to school. I was late, per usual, so I skipped breakfast. High school seniors are too cool for breakfast anyway. My mother wasn’t having it. She chased me out to my car in her pajamas, and pressed a half-eaten SKOR bar and Coke into my hand. “Must eat something!” she insisted. A Coke and a candy bar? Incredulous, I laughed in her face and half-jokingly threatened to report her to the authorities. As I peeled away, I tossed a glance back into my rearview mirror. Mom was still standing in the driveway, rejected offerings hanging limp and forlorn in her hands. Sandwiches, salads and restocking. Seven days a week, 52 weeks a year. To parallel process the daily preparation of three meals a day for their own family was hard. Brutally hard. 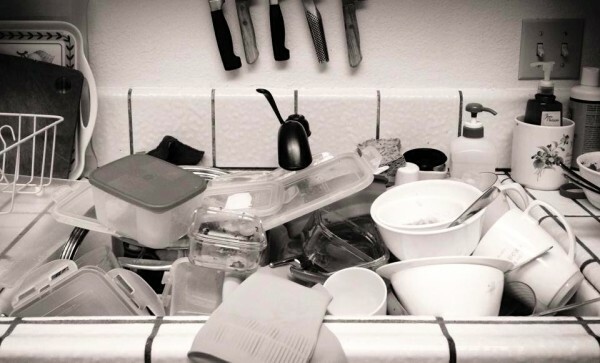 My mother was raised in a culture where you didn’t say “I love you.” You cooked it. The stigma of a drive-thru meal was tantamount to a Walk of Shame: an admission of guilt and abject failure for a Korean mother. It meant she’d abdicated her maternal rights and responsibilities. She’d consented to having her own flesh and blood fed (read: loved) at the hands of a complete stranger. Who knew what ungodly and untreatable pathogens might have been transmitted?! Back in the day, they didn’t have frozen waffles, chicken nuggets or ready-made entrees from Costco. But somehow, we ate. We lived. We grew. Somehow, she made it work. To this day, I rarely eat sandwiches or salads. As an immature 17-year-old, I had no understanding. But now that I’m a harried working mom myself, I get it. Now, I’m the one tearing through the house at 7:58 am, frantically in search of a misplaced permission slip or library book. Now, I’m the one clipping curbs in my minivan, hastily shuttling kids (late!!) to therapy or appointments. Experts say dinner is the most important time for over-scheduled modern families to check in and connect with each other. “3-5 servings of leafy greens per day, preferably organic and locally grown”? My gawd, are you kidding me? I may or may not have, at one time (quite possibly even more than once) gone through the drive-thru for my kid’s lunch, only to repack it at red lights into a “legit” lunch box on the drive to school, just so he wouldn’t be shamed and traumatized by his classmates (or school staff) because his lazy, schleppy, schlocky, sloppy mom couldn’t get it together to pack him a Real Lunch. I may or may not have, on rare occasions, threatened the children for 30 minutes to finish their (frozen) broccoli, sent them to bed without dessert, then self-medicated by eating through a pint of rocky road, a slice of key lime pie, and a fistful of flaming hot Cheetos for my dinner. Takeout sounds perfectly GOOD. Pizza, Chinese, Jacques en le Craque, or Willy Wonka’s magic meal gum. Anything. Whatever works, man. Maternal devotion blended with fatigue, guilt, obligation and desperation make for a powerful, intoxicating cocktail. It can make a Coke and candy bar enticing: A perfectly viable meal option. Twenty years later, my mom and I still laugh about The Candy Bar Incident. It’s become Dokko family lore, rehashed every Christmas and Thanksgiving. Twenty years later, she’s still wracked with guilt and shame over it. Only now, I get it. Which is why we’re able to laugh about it. So, Mom? THANK YOU for that heroic breakfast back in 1988. It was all you could muster at the time. I get that now, and I love you for it. That “meal” eventually fed my soul and understanding — if not my stomach. Sometimes, food that nourishes the soul is best served bittersweet. I thank you for that, and for so much more. Oh, and Mom? I’m so sorry for laughing. Isn’t it amazing how much smarter our parents become once we become parents? Thanks for sharing such a fun memory. And thanks for stopping by DifferentDream.com and adding it to the Dream Team link share. So very true! They’re really making up for lost time quite nicely 😉 And thank YOU, Jolene. For being such a source of blessing, encouragement and practiccal guidance for families like ours. Grateful for the opportunity to connect! That is hilarious, and so true! I think back to days when I was at the church before the sun was up, worked through the day, subsisting on Luna bars, apples and Good-n-Plenty, then I would race home to cook a dinner for my son and husband. My husband would ask, “Are you eating or not eating today?” He knew the answer was often, “Not eating, I’ve got another meeting.” Then back out the door for Missions, Finance, Church Council, or Special Needs Bible Study… But, by golly, they were not going to have fast food for dinner! For me, a banana and protein shake in one hand, doorknob in the other, “Gotta run! Home by 9… I hope! Love you…” (cue the sound of skid marks on the driveway). Oh, Lorna! Yes, yes, and YES. Your comment had me DYING 😀 Do “fumes” count as a food group, especially for Special Needs ministry leaders on Sundays? I really think it should 😉 God bless you! Subscribe to receive new blog posts, updates, and exclusive content. When you subscribe we'll only send you new blog posts and important announcements. Subscribers get exclusice access to tons of free resources. We respect your email privacy and we'll never spam you or sell your info. You are agreeing to get emails that contain content from my blog. 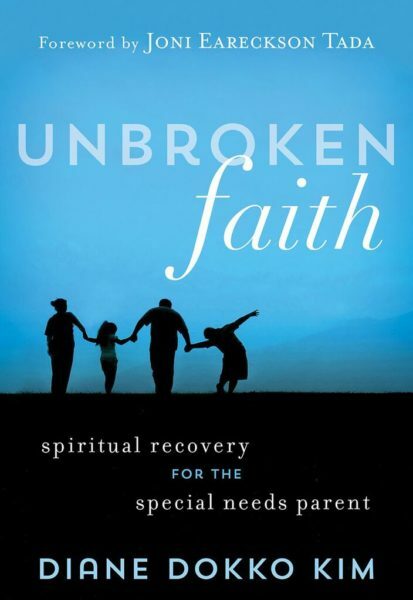 CATEGORIES Select Category “How Can I Help?” Advocacy & Awareness Dads Devotionals Don’t Diss Disability (DissAbility) Faith Rehab (Mad at God) Fun That Works God Understands?! Grief & Loss Healing How to help Humor Inclusion Joni and Friends Letting go, letting God Loser Mommy Moments Ministry and kidmin leaders Mommy Martyrdom No, You’re Not The Only One… Parent Support Recent Diagnosis siblings Special Needs Ministry Spiritual IEP for me Unbroken Faith Uncategorized Why me? Why my child? When you subscribe, you'll receive emails from me when there is a new blog post or announcement and get access to exclusive resources. Thank you! 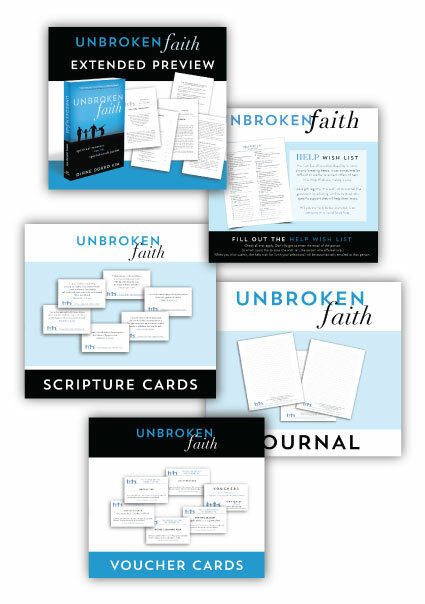 Check your email to confirm and receive your extended preview of Unbroken Faith and the Wish List.